Nantes is France’s sixth biggest city and an important university town, so it will come as no surprise that there is a rich variety of bars and pubs to choose from if you wish to discover Nantes’ busy nightlife. Here is a list of the top 10 bars in Nantes’ center. Le Sur Mesure is the perfect spot for any beer lover. They serve over 180 different types of beer, dark, amber or light, enough to satisfy the most particular tastes. They even have a ‘rare’ selection for real connoisseurs. Very popular with Nantes’ students, the bar can get busy, but as it’s open daily you can always find a quiet moment to sit in a corner or on the terrace to relax with one of their beers. The bar features an attractive décor with wood-paneled walls and large mural-style paintings. Le Briord doesn’t look like much from the outside, but you will be pleasantly surprised by this rustic café with dried sausages hanging from the ceiling and local art displayed on the walls. They bar serves good beer and rum. The spot is most popular during the winter months when there is a roaring fire in the fireplace. Here you’ll find relaxed groups of friends playing cards or chess, and delicious Camembert evenings are held one Saturday a month. They regularly organize themed parties and little concerts that go down a storm. This is a theatrical bar boasting panoramic views over the city from its 32nd floor and featuring unusual interior design including a giant heron and chairs that look like eggs. The drinks aren’t cheap but they’re not exaggeratedly expensive either, and there is a Happy Hour every Friday night. They also host live music on Sunday nights with a variety of genres such as Blues, Funk and Latino music. They also have DJs on Thursday nights. Enjoy watching the city lights sparkle in the darkness while you listen to good music and sip on a refreshing drink. The Melocotton has great Jazz jam sessions and a vinyl record playing every evening during the week. You will feel spoiled for choice with the different concerts, game nights, karaoke, quizzes and themed evenings they organize every week. All generations mingle in the bar’s friendly and relaxed atmosphere. They are famous for their absinthe-based drinks and other cocktails, and their traditionally made terrine is something you should try. The only problem is that the place fills up fast, so make sure to come early. 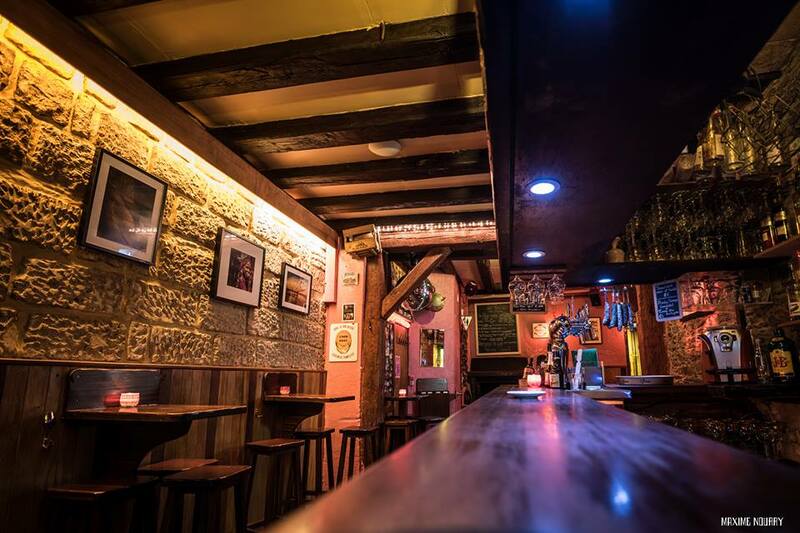 Named after the famous Englishman who, as the legend has it, was the first person to play rugby, the Webb Ellis is the best bar in Nantes for any rugby supporters. They serve excellent traditionally made beers and they have a variety of tasty local cured sausages and cheeses. The bar is artfully decorated with wood paneling, barrels and flags. On a match day it’s recommended to get there early if you want a seat. This bar is reserved for wine lovers, and you will know you are in the right place because it is literally full of bottles. The owner is a professional sommelier and will take your on a tour around France without moving from his bar with his vast collection of regional French wines. This is the place to come for a perfect evening of wine tasting and nibbling on cured sausages and tasty French cheeses. You will need to call in advance because the ‘cave’ books up fast. Riboulingue is an unusual French word for a ‘party’ or ‘binge’. True to its name, this bar hosts very good DJ nights at least twice a week. The music played here is mainly a mix of Electro/Indie Pop, Eclectik Mix, Hip-hop and Funk. The place has a retro look, with lots of old advertising signs hung on the walls. They also have a pinball machine and table football. The terrace is large and looks out onto a pedestrian street so you can sit and relax outside without the stress of cars rushing past. If you love both good beer and wine this bar has the perfect ‘antidote’ for you. Having opened recently, L’Antidote already has quite a following. Situated in a quiet part of the city, the atmosphere is friendly and relaxed thanks to the welcoming and dedicated staff. They also offer delicious tapenades and croque-monsieurs, a very popular French snack resembling a toasted cheese and ham sandwich. 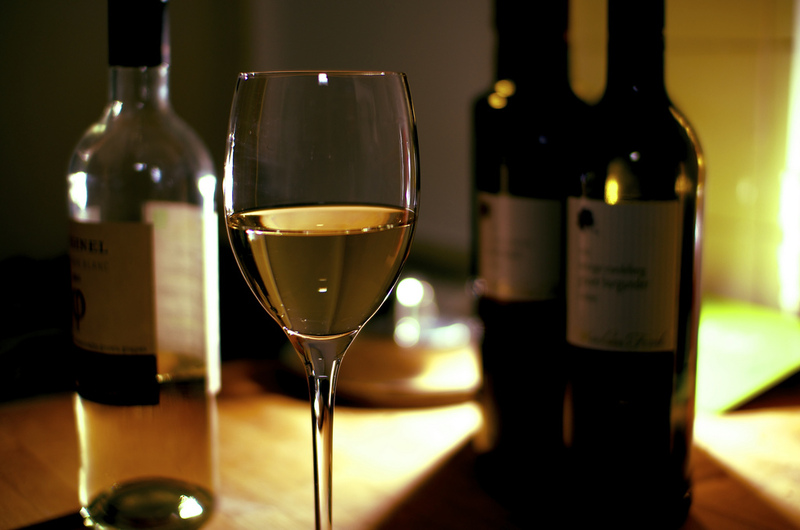 The wine and beer list changes regularly to give customers the opportunity to discover new flavors. This bohemian bar, half bar, half living room, has climbing plants crawling over its walls, vintage wall paper and comfy, non-matching sofas and armchairs. It sits right next to the Basilica Saint-Nicolas, so it’s easy to find, and provides a view of the Basilica’s rose window from the terrace. They serve good beers and original in-house cocktails, and you can order a snack platter to accompany your drinks, try the camembert with honey. If you catch a chill during the winter months they prepare comforting lemon and honey drinks. This is an ideal place to meet people and make new friends. 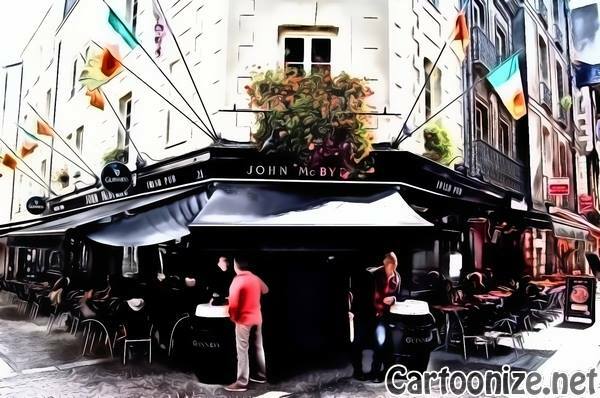 If you’ve already been to a few French bars, check out John McByrne’s Irish pub. Open since 1998, the pub has that traditional Irish look with a spray of flowers over the front door, dark wooden tables hidden in corners and cushy red velvet seats. Situated in the heart of Nantes’ historical center, the pub’s large terrace is rather sought-after. As might be expected, John McByrne specializes in Irish beers and Irish and Scottish whiskey. This is a really popular spot, especially with the students and sport fans, and they regularly organize karaoke nights.